PAC Mate users can enjoy new confidence and have fun while traveling near and far with the StreetTalk accessible GPS (Global Positioning System) solution. Paired with a GPS receiver, StreetTalk is a route-savvy travel companion and real-time exploration guide. Take it for a ride, vacation, business trip, or local jaunt, and keep oriented to your location. Discover new places to explore. Design a custom trip on the go. Even route an entire trip with interesting stops before departing. Based on mainstream GPS technology for Pocket PCs, StreetTalk makes the award-winning Destinator™ application and its maps accessible. StreetTalk can be used with a choice of many popular Bluetooth® GPS receivers. With Bluetooth, the receiver can be placed up to 30 feet from the user – on a window sill, the rear deck of a car, or even on a guide dog harness, so you aren't tethered to a lot of cables or special straps. Combined with a GPS receiver and a PAC Mate, StreetTalk provides a rich orientation solution for the blind and those with low vision. StreetTalk provides information through braille or speech announcements. Ask StreetTalk where you are, and get the nearest address or your latitude and longitude. Tell it where you want to go, and let StreetTalk announce turn-by-turn directions. StreetTalk has access to information about millions of points of interest and can announce approaching restaurants, public buildings, hospitals, metro stations, convention centers, shopping, and other places. StreetTalk can tell you when you’re too far off course and automatically recalculate the best way to get you to where you want to go. Before taking a trip, put StreetTalk in planning mode, and plot your route without leaving your home or office. Insert a CompactFlash card with your maps into the lightweight and portable PAC Mate. Load maps from several states or countries on a single card. Review your route turn-by-turn, then save, print, emboss, beam it, or e-mail it to other users. Locate directions to friends' homes and offices by entering an address, or quickly navigate to the address in your PAC Mate Contacts. Maps for the US, Canada, Western Europe, and Australia — with millions for categorized points of interest — can be purchased on Destinator™ CDs. 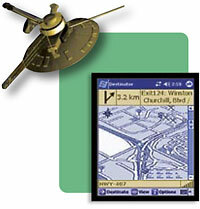 Users can select which areas to install on the PAC Mate using ActiveSync. For more information, visit the Destinator Web site. Note: StreetTalk is an aid to orientation. It is not intended as a substitute for standard mobility aids such as a cane, sighted companion or guide dog. Please observe ordinary caution when walking, especially when vehicles are present.